Revolving around the theme “Writing the Future”, the conference will explore the world of media and communicating Transhumanism. This includes work on Scholarship in Writing, Yellow-Dog Journalism, Games/Film Stories, Science Fiction/Fact, H+ Magazine, and Getting Paid! Further discussion on related disciplines like graphic design, documentary and film production, social media, etc will all converge. How will our media help us communicate about the technologies needed to dramatically extend human life? and to enjoy a radically improved and expanded life in a variety of senses as the future unfolds? The Internet has given rise to much religious imagery. Both dreams of utopia and nightmares of apocalypse abound. It has also shaken up some of our certitudes about the human. Is there even such a thing or are we just underdeveloped machines? What does the expansion of internet technology mean for our experience of time, of space, and of the body? What kind of ethical conundrums arise from our computer-driven technology? Three scholars—Robert Geraci (Manhattan College, Religious Studies, historian) Thomas Carlson (University of California, Santa Barbara, Religious Studies, philosopher, Katherine Hayles (Duke University, Program in Literature, literary scholar) will describe these new mythologies and address these questions. Three faculty members from F&M will respond to their presentations: Misty Bastian (Anthropology), Stephen Cooper (Religious Studies), Peter Jaros (English). There will be ample time for audience participation throughout. The day will end with a panel discussion on a specific topic provoked by the conversation of the day. We cordially invite you to submit papers to the 2013 Conference of the Mormon Transhumanist Association, which will be held on Friday, April 5th, 2013, in Salt Lake City, Ut. The aim of this conference is to address the many issues and topics that lie at the intersection of technology and religion, their impacts on each other, and on society in general. These papers need not focus only on specifically Mormon religious issues. Papers should be approximately two to six pages in length. Authors of accepted papers will be given approximately 10 minutes to present the ideas in their papers at the conference. A selection of the best of those papers will subsequently be published in the conference proceedings, which will be made available online and potentially in print form. Therefore, papers should be written with the intent of eventual publication in mind (full citations, references, footnotes, etc.). Authors whose papers are selected for publication will be given an editor to work with, to prepare their final paper for publication. For more information, visit the event website at transfigurism-2013.eventbrite.com or the official website of the Mormon Transhumanist Association at transfigurism.org. Register today for the 2013 Conference of the Mormon Transhumanist Association, which will be held on 5 April 2013 from 9am to 6pm in Salt Lake City, Utah. Speakers will address the themes of Mormonism, Transhumanism and Transfigurism, with particular attention to topics at the intersection of technology, spirituality, science and religion. Previous conferences sponsored by the Mormon Transhumanist Association include the 2012 conference of the Mormon Transhumanist Association, the 2010 Transhumanism and Spirituality conference, and the 2009 Mormonism and Engineering conference. The conference is open to the public. Click here to learn more about the call for papers. Aubrey de Grey will speak on "Why it is a sin NOT to strive to develop medicine that eliminates aging". He is a biomedical gerontologist based in Cambridge, UK and Mountain View, California, USA, and is the Chief Science Officer of SENS Foundation, a California-based 501(c)(3) charity dedicated to combating the aging process. He is also Editor-in-Chief of Rejuvenation Research, the world’s highest-impact peer-reviewed journal focused on intervention in aging. He has developed a possibly comprehensive plan for the repair of all the accumulating and eventually pathogenic molecular and cellular side-effects of metabolism (“damage”) that constitute mammalian aging, termed Strategies for Engineered Negligible Senescence (SENS), which breaks aging down into seven major classes of damage and identifies detailed approaches to addressing each one. Richard Bushman will speak on "From Humanity to Fulness the Mormon Way". He retired as Gouverneur Morris Professor of History at Columbia University in 2001, and then came out of retirement in 2008 to accept a position as visiting Howard W. Hunter Chair of Mormon Studies at Claremont Graduate University. He is the author of Joseph Smith: Rough Stone Rolling and Co-General Editor of the Joseph Smith Papers. He chairs the Board of Directors of the Mormon Scholars Foundation which fosters the development of young LDS scholars. With his wife Claudia Bushman, he is the father of six children and twenty grandchildren. He has been a bishop, stake president, and patriarch and is currently a sealer in the Manhattan Temple. Carl Teichrib will speak on "A Christian Critique of Christian Transhumanism". He is a Canadian-based researcher, writer, and communicator regarding the historic and contemporary worldview shifts taking place, including political and economic globalization, and socio-religious trends. He is the editor of Forcing Change (www.forcingchange.org), a monthly publication dedicated to documenting and analyzing the structures of transformation, and is a frequent guest on radio talk shows. Over the years, his work has been utilized by other researchers, authors, and commentators. Carl’s biases are transparent: he embraces a Christian worldview (evangelical/conservative), is pro-liberty (versus politically imposed equality), pro-individualistic (versus consensus collectivism), and pro-free market (volunteer and consensual exchange). Peter Wicks will speak on "An Atheist Transhumanist Critique of Religious Transhumanism". He studied mathematics at Cambridge, England, where he obtained his PhD in 1991. Since then he has worked mainly at the European Commission, where his responsibilities have ranged from environment policy to research on industrial accidents. In 2011 he took unpaid leave from the Commission to explore alternative career opportunities. In recent years he has become fascinated by the potential philosophical implications of emerging technologies, and broadly supports the goals of the transhumanist movement. Though raised as an Anglican Christian, Peter currently regards himself for all practical purposes as an atheist. If you are a voting member of the association, or if you are a speaker at the conference, the association will cover the cost of your admission and give your guest a discount. Also, if you represent a media outlet and would like to report on the conference, the association may cover the cost of your admission. If any of these cases apply to you, please contact an association officer or email admin@transfigurism.org for your access code. If you are a student, unemployed or resident of a less-developed country, discounts are available at registration time. Conference organizers will ask you to provide evidence of your student, unemployed or residency status when you check in at the conference. Click here to register for the 2013 Conference of the Mormon Transhumanist Association! 1) You must be a voting member of the association. 2) You must present a paper at the conference. 3) You must live at least 300 miles from Salt Lake City. If you meet the above criteria, you may request assistance by contacting an association officer or emailing admin@transfigurism.org. Lunch will be served at the conference and is included in the reservation price. During registration, you can designate whether you will join us for lunch, and whether you would like a vegetarian meal. Everyone attending the conference is also invited to gather for dinner at a nearby restaurant (to be determined) after the conference. Dinner is NOT included in the reservation price, but you can designate during registration whether you will join us, so that we may arrange a reservation at the restaurant. The association cannot directly cover lodging expenses. However, association members living in Salt Lake City and nearby areas may be able to help. We encourage members willing to provide lodging in their homes and members seeking lodging to communicate on the association Google group and Facebook group. We invite conference attendees to enjoy a leisurely tour of Salt Lake City and possibly attend a session of the LDS Church worldwide conference together on 6 April (the day after the MTA conference). If you would like to participate, please indicate your interest during registration, so that we may make appropriate arrangements. As of September 17th, 2012, the MTA has $5,264 total cash on hand with $706 in the endowment. The Mormon Transhumanist Association has added several member blogs to those aggregated on our website home page and blog page, as well as to our feeds and social network broadcasts -- reaching nearly 20,000 persons per week! Bruce Nielson at "The Millennial Star"
Christian Schumann-Curtis at "Blue Sky GIS"
David Kelley at "The Pratoriate Foundation"
Gary Parker at "Transfigurist Art"
Jonathan Cannon at "Monster Hunting Resources on Demand"
Jordan Roberts at "Zion on my mind"
Juan Lopez at "Renacimiento: cultura paleoconservadora, dentro de una perspectiva etica y humanista"
Rob Lauer at "Reform Mormonism: Gospel Doctrine"
Steve Keane at "Specialization is for Insects"
Tatiana Boshenka at "The Tatiana"
Allen Leigh at "Science and Mormonism"
Brad Carmack at "Thoughtproduct in the life of ..."
Bryant Smith at "Words from the B Side"
Carl Youngblood at "Real Presences"
Chris Bradford at "Inseparably Connected"
Dave Sonntag at "Asian Life Sciences"
David Foster at "Stranger than Fiction"
Doe Daughtrey at "New Age Mormon Pagans: Mormonism and the New Spirituality"
Giulio Prisco at "Turing Church"
Leonard Reil at "Ramblings of an Ignorant Sage"
Mark Swint at "Science and Religion"
Michael Ferguson at "Positive Neuro"
Roger Hansen at "Tired Road Warrior"
Carl Youngblood, CIO and founding member of the Mormon Transhumanist Association, will be presenting at the Annual Sunstone Symposium in Salt Lake City at 9:45am on Thursday, July 26th. The title of his talk is "Compassionate Obsolescence: Coping with Technological Change." Additional information and registration instructions can be found at Sunstone's web site. The fifth issue of the Transfigurist Quarterly, highlighting news and events related to the Mormon Transhumanist Association, is now available. You're invited to download and share it. The 2012 conference of the Mormon Transhumanist Association was held on 6 April 2012 at the Salt Lake City Public Library in Salt Lake City, Utah. Speakers addressed the themes of Mormonism, Transhumanism and Transfigurism, with particular attention to topics at the intersection of technology, spirituality, science and religion. The conference streamed live for online viewers, and recordings are now available on the Mormon Transhumanist Association channel on YouTube. Please post comments and questions, and share these recordings with your friends and family. Thank you! 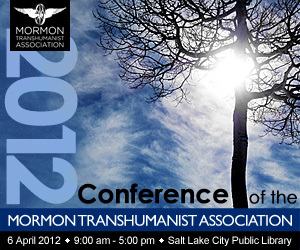 The 2012 conference of the Mormon Transhumanist Association will be held on 6 April 2012 from 9am to 5pm at the Salt Lake City Public Library in Salt Lake CIty, Utah. Speakers will address the themes of Mormonism, Transhumanism and Transfigurism, with particular attention to topics at the intersection of technology, spirituality, science and religion. The schedule has been revised as follows: Roger Hansen will be unable to attend, and Lincoln Cannon will speak on "The Consolation: An Interpretive Variation on the King Follett Sermon of Joseph Smith". The conference is open to the public. Register today! The Mormon Transhumanist Association has released results of its 2011 member survey. The survey results provide aggregate statistics of members' views on religion and politics, satisfaction with the association, and demographics. The 2012 conference of the Mormon Transhumanist Association will be held on 6 April 2012 from 9am to 5pm at the Salt Lake City Public Library in Salt Lake CIty, Utah. The conference is open to the public. Register today! Speakers will address the themes of Mormonism, Transhumanism and Transfigurism, with particular attention to topics at the intersection of technology, spirituality, science and religion. Previous conferences sponsored by the Mormon Transhumanist Association include the 2010 Transhumanism and Spirituality conference and the 2009 Mormonism and Engineering conference. Lincoln Cannon and Chris Bradford were guests on the Mormon Matters podcast, with host Dan Wotherspoon and panelist Tyson Jacobsen. They discuss the future, especially as it is and promises to be even more impacted by technological advancements, along with several other major themes in Transhumanist debates. They also discuss the relevance of religion in a world increasingly dominated by science and secularism, and they pay particular attention to how Mormon and other religious concepts and terms can be given new life when informed by Transhumanist themes. They also examine the type of actors the world needs as it hurdles toward completely unprecedented forms of life and sociality. This Group welcomes papers on any aspect of transhumanism and religion and seeks perspectives from a variety of religious traditions. Papers may identify and critically evaluate any implicit religious beliefs that might underlie key transhumanist claims and assumptions. For example, are there operative notions of anthropology, soteriology, and eschatology at play in transhumanist quests? Papers might consider how transhumanism challenges religious traditions to develop their own ideas of the human future; in particular, the prospect of human transformation, whether by technological or other means. Papers may provide critical and constructive assessments of an envisioned future that place greater confidence in nanotechnology, robotics, and information technology to achieve virtual immortality and create a superior posthuman species. We welcome feminist analyses and more overtly philosophical critiques of posthuman discourse and encourage original research. “Transhumanism” or “human enhancement” refers to an intellectual and cultural movement that advocates the use of a variety of emerging technologies. The convergence of these technologies may make it possible to take control of human evolution, providing for the enhancement of human mental and physical abilities deemed desirable and the amelioration of aspects of the human condition regarded as undesirable. These enhancements include the radical extension of healthy human life. If these enhancements become widely available, it would arguably have a more radical impact than any other development in human history — one need only reflect briefly on the economic, political, and social implications of some of the extreme enhancement possibilities. The implications for religion and the religious dimensions of human enhancement technologies are enormous and are addressed in our Group. We are interested in encouraging and providing a forum for a broad array of input from scholars, including Asian and feminist. For more information, or to be placed on a very occasional mailing list, contact Calvin Mercer at mercerc@ecu.edu.